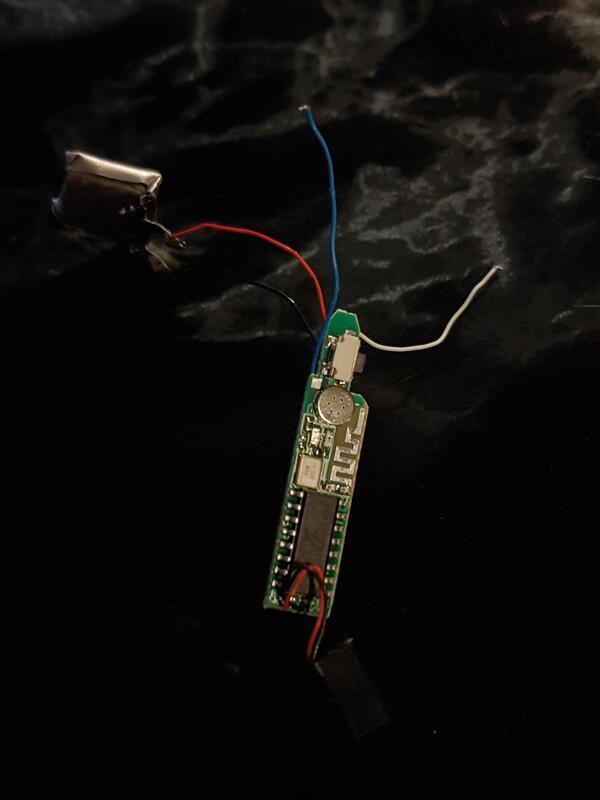 so I got a cheap knock off airpods for christmas and the sound was terrible and they were just overall terrible so I opened one up and took everything out of it and this is how it looks, can I connect the white and blue wires to a female aux cable and make any wired audio device "wireless"? You won't know unless you try. Start testing with headphones and powered speakers. You might not get the perfect sound if the circuit performs some EQ on the signal to match the buds. What ^he says. Nothing is gonna blow. Worst can happens sounds weird. and also I'm trying to switch from the standard 60mah battery to the docks 1000mah battery but the volts are different 3.22v on 60 and 4.03v on the 1000 and I'm right now really dumb and don't know how find how much amps the board needs to know how big of a resistor I need for the voltage to match? If you can measure voltages, you can measure current as well - connect your multimeter in series between the battery and the thingy. You need 0.8V drop across that resistor, and you'll know how bif it should be by measuring the current. On the other side - I'd wont bother at all, and connect the thingy directly to your 4V battery. As for the dull sound - I suppose this is some built-in "correction" for these particular headphones.